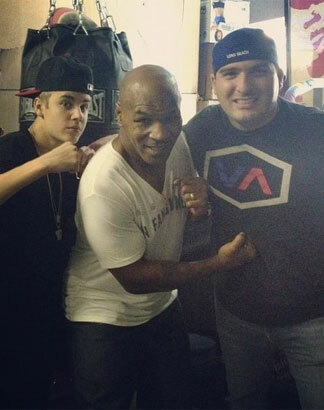 Pop star Justin bieber is wanted for questioning by police after attacking a photographer on sunday May 27,2o12 .Just before the day ,former heavy-weight champion mike tyson posted an image of himself and Bieber on Twitter as well as footage on You Tube of the pair working the heavy bag in Tyson's garage. The footage shows Bieber pounding his fists into the punch bag that is being held by Tyson, and afterwards the pair high-fived each other. The news of the pop star's boxing training comes shortly after he was accused of assaulting a photographer who wanted to snap pictures of him and his girlfriend,teen actress selena Gomez, after they walked out of a shopping mall, The commons at calabasas. See video of justin training with mike below.